1. When my blog is broken, I’m sad cause I’m missing out on NaBloPoMo. 2. 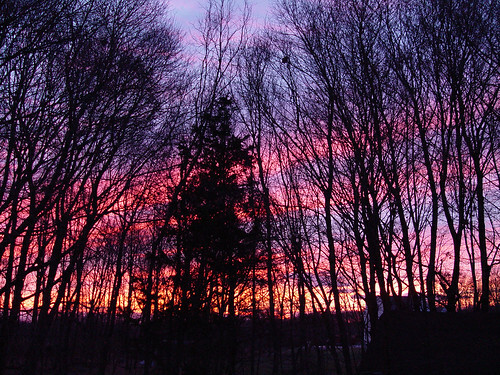 I saw the most amazing sunrise this morning [see above]! 3. Sweeney Todd is the new movie I’m most looking forward to seeing. 4. Work: Necessary and evil. 7. And as for the weekend, tonight I’m looking forward to a nice glass of wine, tomorrow my plans include more Christmas decorating and Sunday, I want to go to Boston! 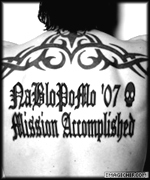 I finished, both NaBloPoMo AND My Sacred Life! Although I can’t prove it, cause the database on my fondofsnape.com blog was corrupted, I know I did it, and that’s really what counts! I found this Official Completion Token over at Moving Right Along and I’m putting it right here at the end of my last entry in November! Congrats to all who finished!